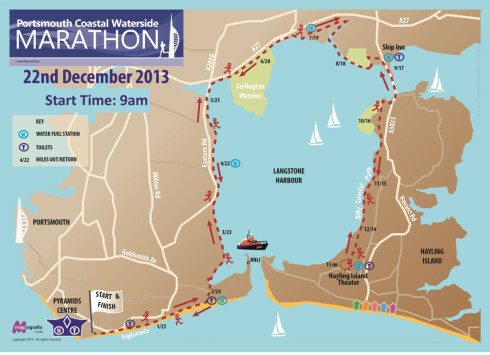 This will be the 4th year for the Portsmouth Coastal Waterside Marathon. If you like to run something slightly different just before Christmas then this is for you. Full Marathon running from South parade pier to the end of the Hayling Billy line and return. With some fantastic views across Langstone Harbour. All in aid of the RNLI. Don’t miss out. This event will sell out quickly due to only allowing 1000 runners. Bespoke Medal, Winners Trophies, Goody Bag, Chip Timing, Hot Soup, Christmas Cheer, Santa. Mullied Wine, Brandy, Rum, Jelly Beans, Jaffa Cakes, we have a wonderfull selection at the water stations, and there will be one extra this year. Changing, Toilets, Onsite parking, Refreshments, Supervised bag storage, Onsite retailer, pay and display parking £6.80p for day, Massage, Swimming pool discount. 50p for a hot shower. Please note no change will be avaliable on the day. Please bring change if required for parking . 6 hour time limit on this event due to tide times. You could get your feet wet if you take that little bit too long. If you have not reached half way by the 3 hour mark then the organisers will have to pull you out of the race.